When displaying a large amount of data, paging is often used to make viewing the data manageable. It's also useful to give some context of the entire data-set and a easy way to drill-down into particular categories. The common approach to doing this is a "faceted search", as shown in the image below. Note how the count of each category within the current search is across the top. Create an index to work against. For the Manufacturer field, look at the documents and return a count for each unique Term found. 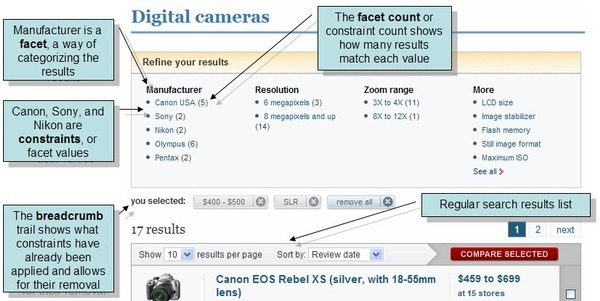 "Range": "Cost between 200 and 400"
"Range": "Cost between 400 and 600"
"Range": "Cost between 600 and 800"
"Range": "Megapixels between 3 and 7"
"Range": "Megapixels between 7 and 10"
The faceted search does not take into account a staleness of an index. You can wait for non stale results by customizing your query with the WaitForNonStaleResults method. As an alternative for creating a list of facets and passing it to the AggregateBy method, RavenDB also exposes a dynamic API where you can create your facets using a builder. You can read more about those methods in our dedicated Client API article here.